The Quilting Edge: What's My Angle? So, what's up with all these QAYG angular shapes?? Well, in my experience triangles and any other odd angled piecing can be tricky!! Matching those little points, which naturally never quite match up and let's not mention those crazy bias edges!! 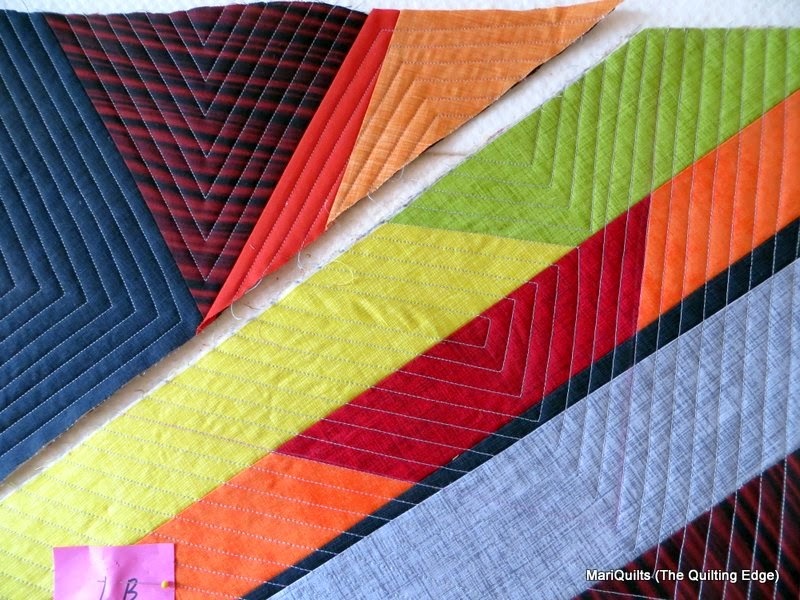 And if that's not enough, how do you get that nice angular quilting? Doing it this way bypasses so many of those problems. As my husband is off for another week of sailing....yes another whole week, no wonder I feel no guilt when I find my self wandering off to the nearest quilt shop.....I'm playing with some very sail like shapes myself. I'm experimenting with angular shaped pieces of batting rather than my regular square ones, which will be joined together after being quilted. Is there any advantage to that, you might ask?? I hope so....the emphasis being on the word experimenting. 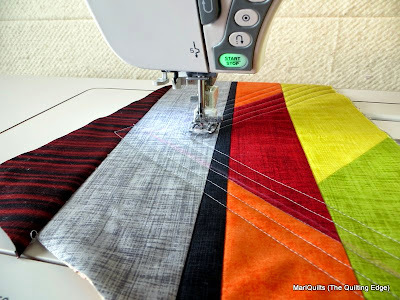 As you can see, there is definitely an advantage when it comes to quilting the straight line angles that I so love. 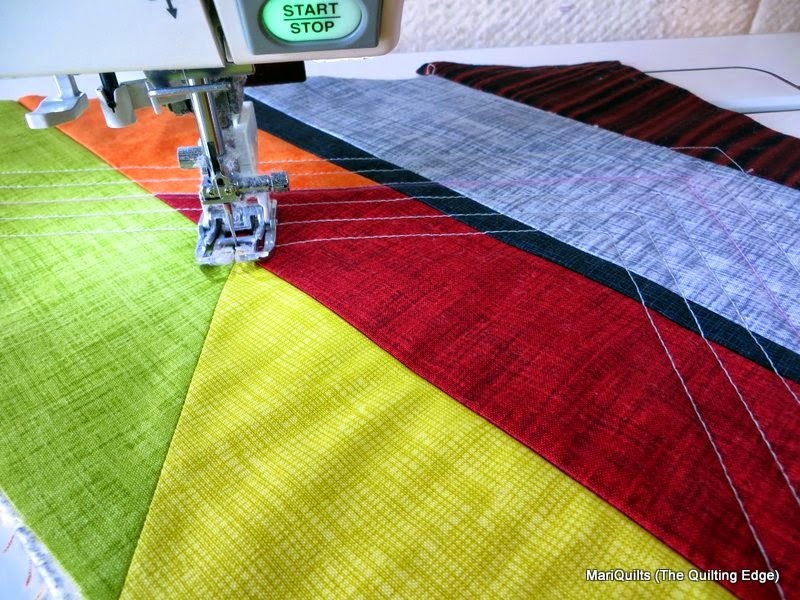 If I was quilting with a long arm, ruler work would most likely be required. Or, if I was quilting the whole pieced top at once I would have to wrestle and turn that quilt under the machine multiple times.....not my idea of a good time!! All the different angles are leading to a few unexpected surprises as well. My motto is....... let the unexpected take you, where perhaps your imagination would not have. Great angles! Very sharp and neat. Congrats. I know that's tricky. 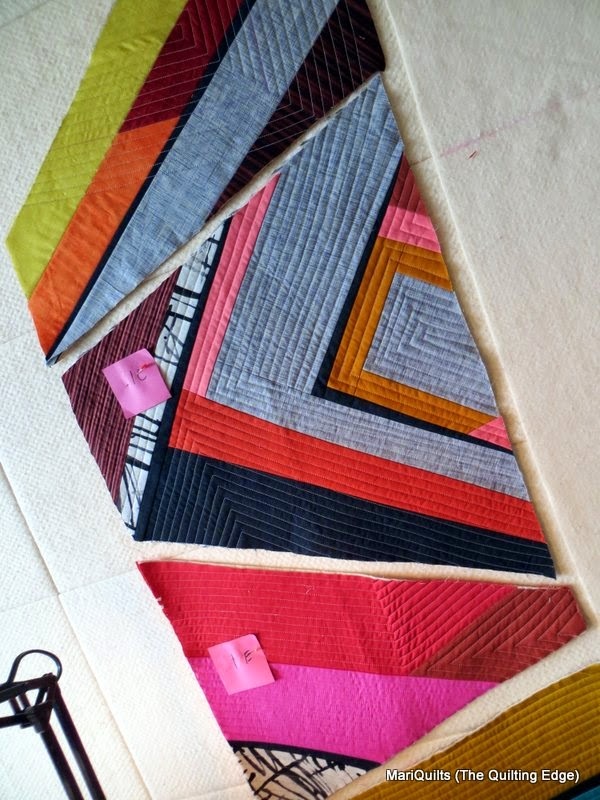 I'm liking this quilt a lot and can't wait to see how it all comes together. Oh, and I was surprised you didn't like the Kaffe stripes. I thought it looked great. But I trust your judgment more than mine!!! Love you experiments! Wonder how you are joining those bits together! Curious to see where this will take you! 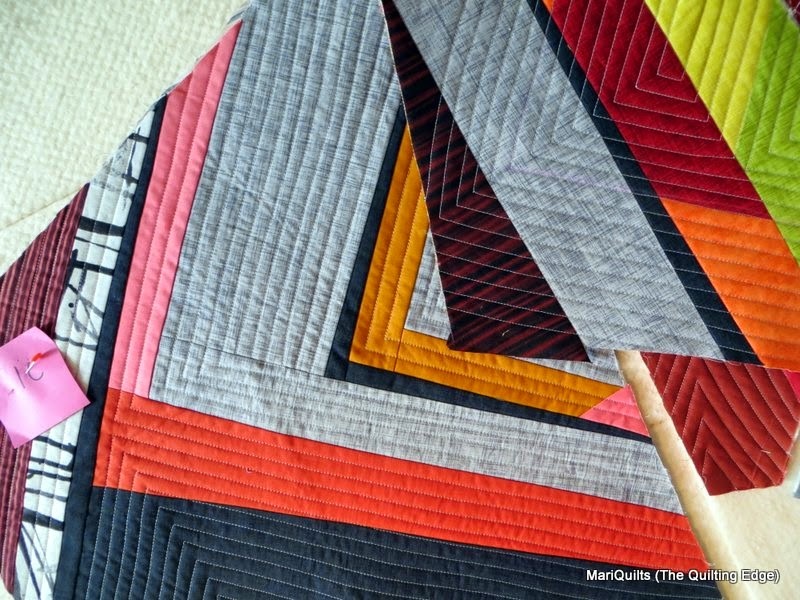 Love the quilted angles! Loving your "change of direction"! This is looking great, I expect you will have no trouble with the angles on the batting but I am interested to hear about how it goes. Looks great and fun too. What kind of quilting thread do you use? Just wondering. Do you use the same thread in the bobbin too? I love your blog so much. 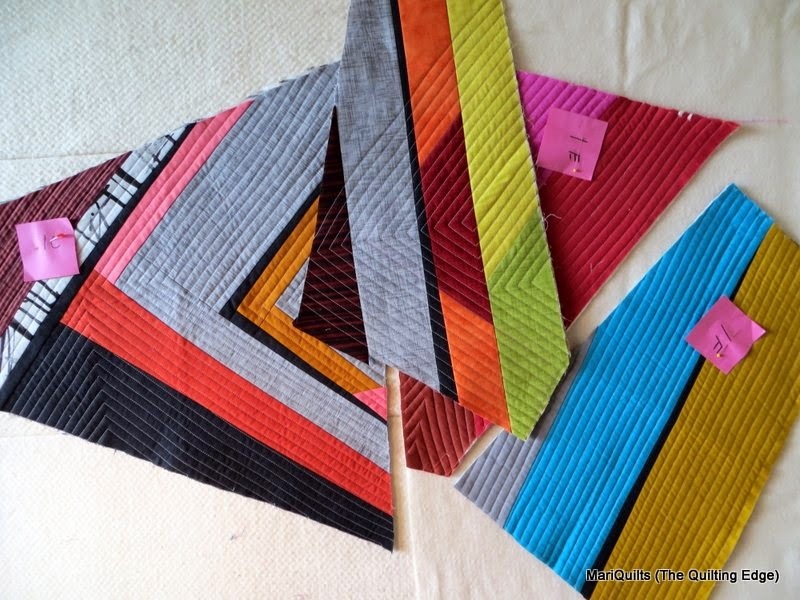 Your QAYG experiments are awesome, thanks for sharing so many in-progress pics. I love the look, but am lost on how you plan to put them together. You do have a sandwich, with all three layers, right ? I just love the look of these angles. I'll be very interested to see where you go from here with the piecing. The look of the angles is so different from rectangles or squares; it opens up lots of new possibilites. Doing some catch up tonight. These are really beautiful!